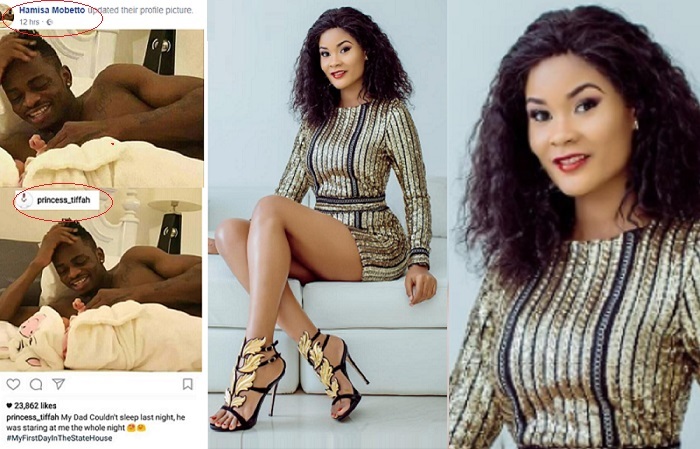 Hamisa uses Zari's pic to update her profile, bashed by Zari's fans..
Hamisa Mobetto and Zari share one thing in common, Diamond Platnumz, who happens to be their baby daddy. One is the main chic and the other is a side chic, but this very thing has bothered the video vixen so much that she will do anything to remain afloat as compared to making her sink. Her yesterday stunt has fallen flat. The mom of two in her latest bid to make her presence in the life of Diamond Platnumz felt has failed miserably when she tried to share a pic on her wall. The pic of Diamond Platnumz bonding with his daughter, Tiffah, was the pic that Hamisa updated on her wall attracting a lot of bashing in the process. The pic is for Zari's first born with Diamond Platnumz, Tiffah, who happens to be a girl and yet Hamisa's baby with the Hallelujah singer is a boy. Hamisa did not do enough research to know that blue is for boys and pink for girls, so if the pic she was sharing was meant to be Diamond Platnumz showing some love to his child with Hamisa, Prince Abdul, the baby could have been wrapped up in a blue baby shawl, at least that is a golden rule for celebrity babies. Hamisa could be having a feast day if this was the first time this pic was appearing, but the mere fact that the pic is as old as Zari and Diamond Platnumz's daughter, Hamisa has to go back to the drawing board and come up with something else as this has certainly not worked out. Using Zari's pic can only mean that Hamisa has no pic when Diamond Platnumz is bonding with Prince Abdul and this is eating her up as the baby is fast growing and those chances are fast running out as the baby is growing way past that stage. The pic that Hamisa used had over 20k likes at the time it was used and this was the caption on the pic; "My dad did not sleep the whole night as he was staring at me the whole night." Meanwhile, Hamisa was forced back to TZ as Kenyans were preparing for the repeat Presidential elections and not forgetting that on Monday, (Oct 30), the mom of two will be required to appear in court over the child neglect case she filed against the Salome star, Diamond Platnumz.